The danger of telling people you write a blog about vegetables, is they actually expect you to know something about vegetables. Go figure. Unlike my husband, who comes from a long line of “just-so” (but oh-so lovable) story spinners, I was not born with bllsht gene. At the Saturday Farmers Market at Portland State University, I lucked out. Seeing Pineapple Tomatillos grown by Sun Gold Farm for the second time, I’d already done some preliminary research. 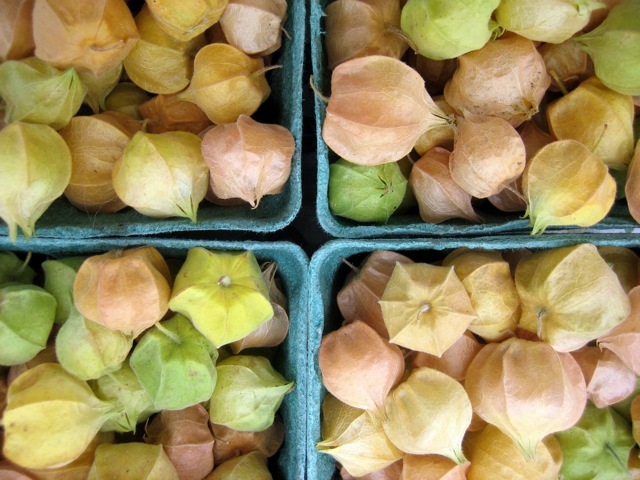 When a couple noticed me eyeing them and asked me what they were, I told them they were Pineapple Tomatillos, that they could eat them raw or use them in salsas or to make jam. Typical Tomatillos are used in salsa verde (green salsa) and these pineapple guys would make a nice addition to a salsa verde. They’re related to tomatoes, but are a different species of vegetable, and actually they’re not a vegetable at all, really they’re a fruit. This might have been more information than they were looking for. But I felt like a veggie expert, if only for a few minutes. But then, delving deeper into the Tomatillo world, I discovered that what I said were Pineapple Tomatillos may not actually be Pineapple Tomatillos at all. Do you have a recipe that includes Pineapple Tomatillos? Please let me know and post it on Culinate!